There’s not much better than standing in the shower and feeling as though you’re standing outside in the rain, feeling the gentle drops hit your skin. A rain showerhead mimics the feeling of a gentle rainfall with water coming from directly above you. These rain shower heads are a luxury upgrade for the bathroom, but one could be just what you need for the spa-like experience you want. If you’re looking for the best rain showerhead, look no further than this guide, which pulls five of the best options and gives you in-depth reviews to help you make a choice. If you like having both the option of a regular showerhead and a rain showerhead, then the Sarlai Double Rain Hotel Spa Bathroom Combo may be for you. This set includes both, so you’ll still have a handheld showerhead ready for full-body coverage. 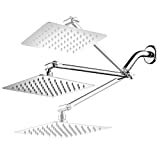 HotelSpa Giant 10″ Stainless Steel Rainfall Square Showerhead with Solid Brass Adjustable Extension Arm is an option for best rain shower head for people who currently have a standard showerhead arm and don’t want to remodel. 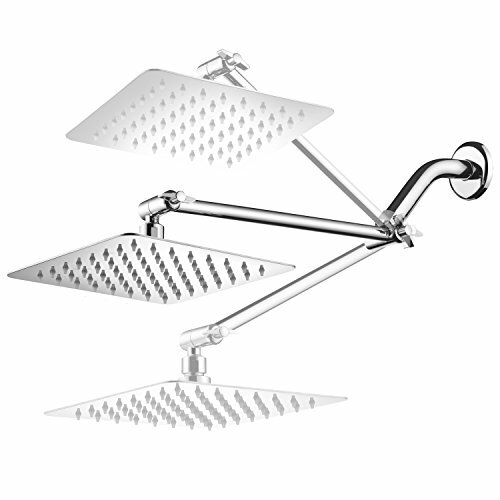 The extension arm allows you to work with your design and still have rainfall in the shower. 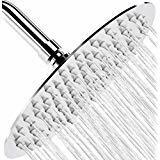 LORDEAR Stainless Steel 12 Inch Adjustable Rain Shower Head has 324 nozzles to create the ultimate luxurious shower and the head adjusts for coverage where you need it. LumoSpa Rainfall Shower Head has self-cleaning silicone jets that prevent the showerhead from clogging in hard water so that you can enjoy the rain-like experience. 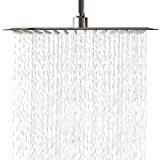 NearMoon Ultra Thin Rainfall Showerhead is an excellent option for large showers at 12” wide and its extra thin design can match a modern bathroom style. 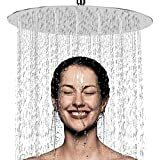 Our rain showerhead reviews focus on our top five picks for the best rain shower head based on customer reviews, performance, and features that give you the most functionality for your money. The Sarlai Double Rain Hotel Spa Bathroom Combo is at the top of the price range for the showerheads we review in this guide, but it also packs in a lot of functionality. This showerhead is like one you’ll see at mid to high-range hotels, offering both a rainfall showerhead and a handheld showerhead for dual function. If you still want a handheld showerhead for rinsing your body or washing young children in the bathtub, then this combo can meet your needs. The rainfall showerhead attaches to your wall mount with an attractively curved arm, while the handheld portion self-connects to the lower arm. With five water settings for both showerheads, you can choose what you need for ultimate comfort. Several customers agree that this showerhead gives them a lot of options for a relatively low price and that the unit it of high-quality in both its feel and design. 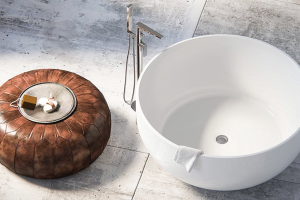 HotelSpa’s square rainfall showerhead may be a good option for people with low to medium water pressure to enjoy the benefits of a spa-like shower. The showerhead has a water-saving reducer included to make sure your water doesn’t go to waste, yet its jets give just the right amount of pressure. Thanks to the extension arm on this showerhead, people with a standard hookup can utilize its features. 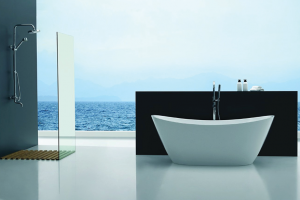 The arm has a 2-foot vertical range and rotates up to 180-degrees to make it work within your shower space. One complaint some customers have with this showerhead is that it doesn’t seem to hold up well for people who have high water pressure. The pressure may cause water to start escaping from the sides of the showerhead instead of through the jets. Although the LORDEAR Stainless Steel rain shower is a bit higher than others on our list, this showerhead also turns your shower into a true rainfall. 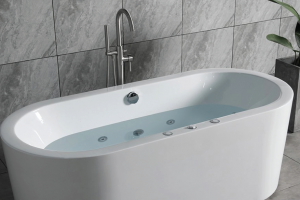 It’s packed with 324 nozzles so that water escapes just the full surface area to cover your body comfortably. 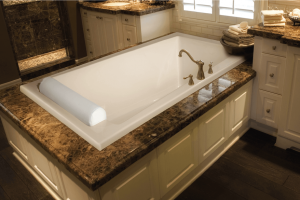 The jets are made with silicone to prevent buildup from hard water and make them easy to clean. With its stainless-steel finish, you can expect a rust-free showerhead for years to come. This rain showerhead may feel a bit heavier than other similar models, but it also feels full of quality and durability. 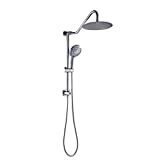 Several customers state that this showerhead offers an excellent shower experience for the price and gives their bathroom a quick and easy style upgrade. 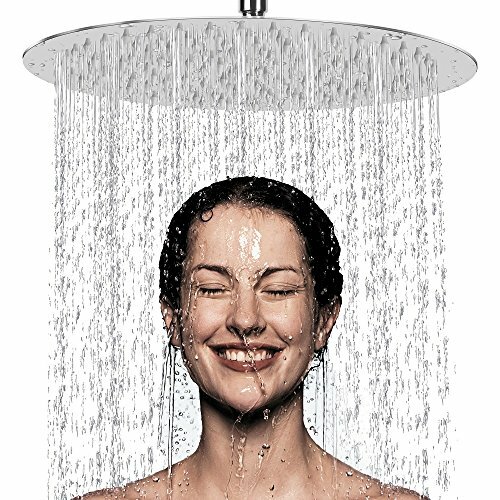 LumoSpa’s rainfall rainshower shower head is a budget-friendly one that can meet the needs of small shower areas. 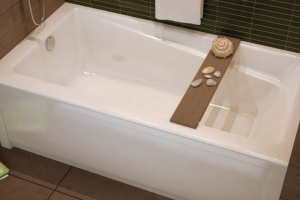 With an 8-inch width, you can still benefit from a rainfall shower without water escaping from your shower space. The LumoSpa showerhead has flexible silicone jets that protrude slightly from the surface rather than sitting flush with it, which makes them easier to clean. Plus, they even do some self-cleaning on their own by preventing grime buildup and blockages on their own. The tool-free installation method of this showerhead can make it simple to install on your current showerhead arm, or you can mount it to the ceiling. Most customers are very impressed with the look and quality of this showerhead and pleased with the amount of water it puts out for its smaller size. However, a few people have had issues with water leaking from the connecting joint even when appropriately tightened. 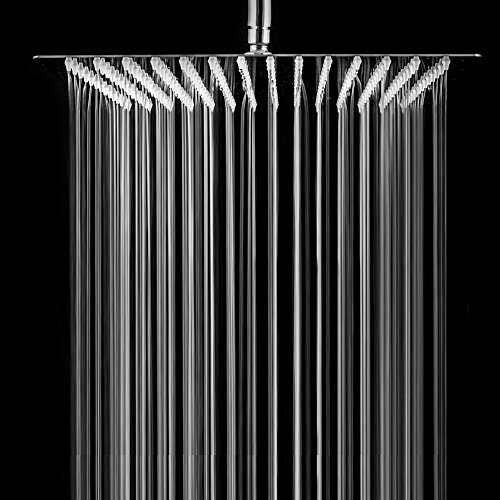 The NearMoon Ultra Thin Rainfall Showerhead comes in either a 12-inch square or circular design to match the curves and angles of your bathroom. Since it’s made from 100% stainless steel, this durable showerhead should withstand rust over time. NearMoon uses food grade silicone for the nozzles to protect against bacteria buildup from hard water and grime. Coupled with the ultra-smooth surface, you should find that this showerhead is relatively simple to clean. This rain showerhead can also help you save water with its air pressure design to help pressurize the water that enters, so you’ll use less of it during your shower. People who have purchased and installed this showerhead say that it’s one of the best investments they’ve made for their bathroom, allowing full-body coverage for a quicker, water-saving shower that’s also comfortable and relaxing. Just like regular showerheads, rain showerheads can sometimes have multiple sprayer settings, like massaging or pulsing, that make the water do different things in the shower. Others just have a regular rainfall setting. If options are essential to you, then you may want to pay extra to get a showerhead with multiple waterfall settings. However, if just the rainfall is what you’re after, you can save a lot of money by sticking with a single-setting model. Rain showerheads typically range in size from 6 to 12 inches. When it comes to these showerheads, bigger is usually better because their job is to provide coverage on most of the body at one time. Small shower areas, though, may not be able to handle a 12-inch showerhead and will, instead, need a more compact design. Consider the width of your shower space and choose a showerhead that won’t overpower the space. These showerheads come in several finishes, so it’s important to pay attention to your options if you’re purchasing one online. The last thing you want is to accidentally order a gold finish when your bathroom has all stainless-steel finishes. You’ll most commonly see chrome, stainless-steel, bronze, and nickel showerheads as options. Before you purchase, consider the overall look you want for your bathroom and how your showerhead should fit into the design. Also, rain showerheads can come in different shapes and styles. Circles and squares are the most common shapes, but some are also rectangular. The arm may also have either a straight or curved design if you choose one that can hook up to a regular showerhead fixture. Rain showerheads were meant to be installed on the ceiling of your shower, but new models are designed to also work with standard showerhead hookups so that virtually everyone can experience rainfall in their shower. Those that can attach to a regular showerhead mount will have an extension arm that will let the showerhead sit parallel to the shower floor so that water falls straight down, just as it would if the showerhead was installed on the ceiling. Price is just as important as features when you’re choosing your showerhead. There’s no reason to spend more than your budget allows to get what you want. Fortunately, rain showerheads themselves aren’t very pricey, but the cost to reconfigure the shower to install one on the ceiling could be. If that’s not within your budget, you can choose a wall-mounted version to create the same experience at a fraction of the cost. If you’re looking for the most possible functionality in your bathroom but still want the benefits that a rainfall showerhead gives you and your family, then the Sarlai Double Rain Hotel Spa Bathroom Combo may be the best option. Although it’s the highest price on our list, we like that the Sarlai showerhead is like getting two showerheads in one. With the addition of five water settings – something that the other showerheads on our list don’t have – this unit offers a lot of options at one price. Its stainless-steel construction and rubber nozzles make it both durable and easy-to-clean, so you can enjoy your purchase for a long time. Whether you want a simple bathroom upgrade or are looking to overhaul your space, a best rainfall rainshower head can be the perfect addition. Now you know what to look for in the best rain showerhead, and we hope that our reviews helped lead you to the best one for your family.